Children must be taught morality. They must be taught to recognise the authority of moral standards and to understand what makes them authoritative. But there’s a problem: the content and justification of morality are matters of reasonable disagreement among reasonable people. This makes it hard to see how educators can secure children’s commitment to moral standards without indoctrinating them. In A Theory of Moral Education, Michael Hand tackles this problem head on. He sets out to show that moral education can and should be fully rational. It is true that many moral standards and justificatory theories are controversial, and educators have an obligation to teach these nondirectively, with the aim of enabling children to form their own considered views. But reasonable moral disagreement does not go all the way down: some basic moral standards are robustly justified, and these should be taught directively, with the aim of bringing children to recognise and understand their authority. 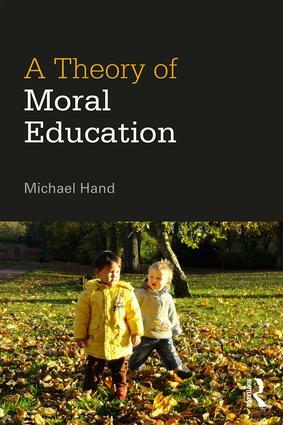 This is an original and important contribution to the philosophy of moral education, which lays a new theoretical foundation for the urgent practical task of teaching right from wrong. "Hand has written a book on the deeply difficult problem of moral education that is a marvel of clarity and cogency. He never succumbs to the evasiveness or the dogmatism that almost always undermines writing on this topic. When he takes a stand, you will always understand the reasons why he does so, even if you disagree with him. No recent book on the topic can compare with this one." Eamonn Callan, Pigott Family Professor of Education, Stanford University, USA. "This groundbreaking book should become essential reading for anyone interested in moral education in modern multicultural societies. It is written in a straightforward, direct style, and is packed with careful arguments. Whether or not you agree with Hand’s arguments, you’ll come away with a much better understanding of what is at stake. Highly recommended." Harry Brighouse, Professor of Philosophy, University of Wisconsin-Madison, USA. Michael Hand is Professor of Philosophy of Education at the University of Birmingham, UK.